In order to determine the cleavage sites on telRL, Huang et al. (2004) used the duplex oligonucleotides already described. However, in this experiment the substrates were not nicked and the labelled phosphate was incorporated at different positions along the length of the telRL target on the top strand. After processing, those substrates whose phosphate is on the left of the cleavage site would retain the label on the 28-bp product. If the label is on the right side of the cleavage site, the 38-bp product would be labelled. When this set of substrates was treated with TelN, the labelled phosphates up to nucleotide 25 were identified on the 28-bp product, while a phosphate at position 26 and beyond remained with the 38-bp product. Thus, cleavage of the top strand occurs between the nucleotides 25 and 26, three nucleotides away from the dyad symmetry centre (Fig. 8). The same experiments were performed with substrates in which the bottom strand was labelled. Similar to the top strand, cleavage occurred three nucleotides right of the dyad symmetry centre between positions 31 and 32. 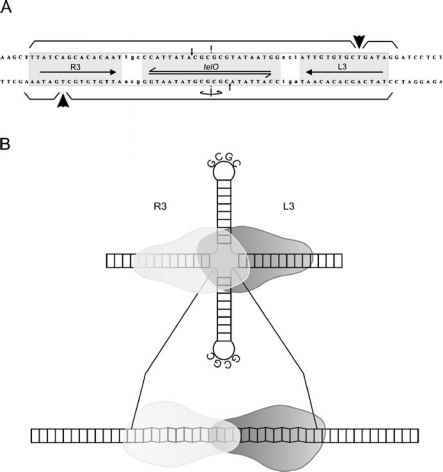 Hence the protelomerase makes during the generation of the hairpins a pair of dyad-symmetric staggered cuts 6 bp apart that leave 5' protruding ends (Fig. 8).